I'm so excited I could almost cook! | Your home, only better. Home » I’m so excited I could almost cook! Seriously, this week’s reveal of the House Beautiful Kitchen of the Year for 2009 did not disappoint. 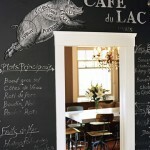 Ina Garten (Barefoot Contessa) inspired a space I could easily learn to call home! Belly up to the counter = fewer steps for cleanup, and a great place for guests to hang out! LOVE the black and white contrast. Beadboard and ceiling add subtle architectural interest and texture without being overwhelming (for some reason that was really fun to say). I like the “homey” lamp on the counter – an cozy unexpected touch. While the “tree” is very pretty to look at, it would drive me bonkers in real life. But great focal point if you’re having a party (which this is). But I believe there are some cabinets that need doors to hide the less-attractive kitchen items. I personally like a mix of open, closed and glass front cabinets. 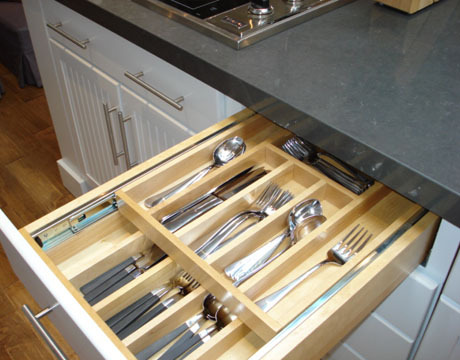 I’m truly salivating over this two-tier flatware storage concept! And how much better is this for storing spices! Sure beats spinning a lazy susan (I dislike that term) around in a corner cabinet! 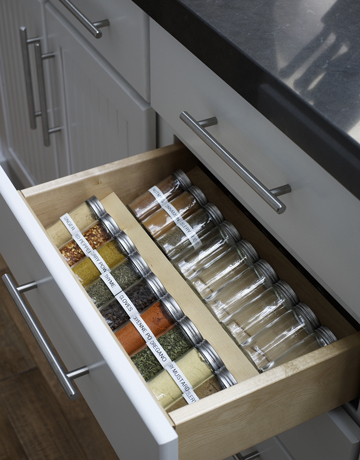 (Little bragging note here: I moved my spices to an expandable organizer in my kitchen drawer a year ago, and it darn near changed my life – or at least my outlook on cooking). 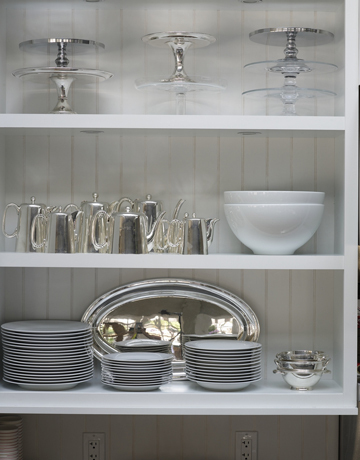 One constant about kitchens – you always need a command central space to avoid the inevitable corner of clutter. This one is very pretty, but I personally think it needs more emphasis on storage of paperwork. Just sayin’. There is a trend towards including living spaces in the kitchen (since everyone hangs out there anyway). I love the colors and simplicity of this design. I especially like the candle holders. While I still have my eye on my own personal Dream Kitchen, this has given my lots of ideas to add to my laundry list of wishes. What do you like (or dare to dislike) about this kitchen? How does it compare to past winners? I don’t know about you, but I’m inspired to try one new recipe per week now. Thanks Ina for inspiring such a fabulous kitchen, and a big thanks to House Beautiful for making it happen and letting me share this with you! Looking forward to KOTY 2010! 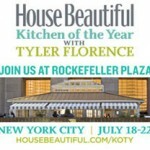 One last note: if you’re not already following House Beautiful on Twitter, you should! 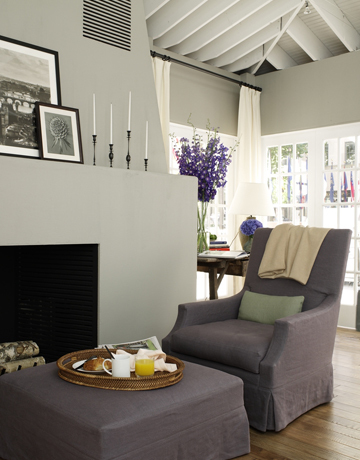 www.twitter.com/house_beautiful. 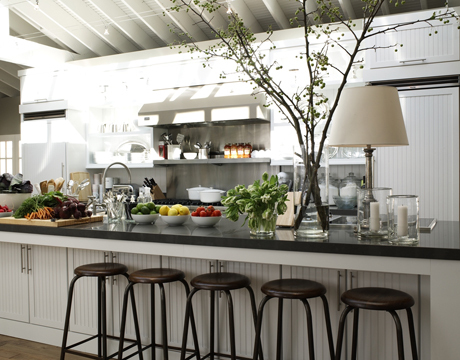 « House Beautiful’s 2009 Kitchen of the Year! Oh wow…I see what you mean about the handles! And re: the island cabinets – I wonder if there is access to them from the other side? Now I do like the lamp because it’s unexpected. I thought the cooktop was on the other counter (can’t tell from this pic). Thx for your excellent comments! This is awesome! I haven’t seen it yet. sort of what I’m going for but on a much grander scale. I love a big kitchen project! Good luck with it!!! Love the open upper cabinets, Caesarstone counters and beadboard cabinets; hate the handles (especially under the island) they catch on clothing (speaking from experience) and the stainless steel finish is too cold against the warmer tones of the range and hood. I think it would be awkward to get under the island to reach into those cabinets, too. .-= Jane @ Beach House´s last blog ..Clothkits =-. .-= Jenny Kerr´s last blog ..My "New" Library Window =-. What a gorgeous kitchen. How could you not be inspired to cook in such a space? Or at least call and order some really good takeout and eat it off lovely china! .-= Cass @ That Old House´s last blog ..A $65,000 Kitchen Giveaway and Two Birthday Cakes To Share =-. 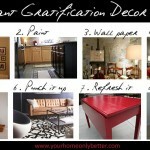 .-= daily decorator´s last blog ..Set The Table =-. I like the tree as long as it doesn’t poke me in the eye. I think it’s the height and textures in the tree that I like. The counter itself it so long that they had the “style” the daylights out of it or it would be a cold looking place. Can you imagine the counter top cleaned off? .-= Terry´s last blog ..Before / After =-. I could live with that kitchen 🙂 I really like the ceiling, and look at all those cabinets in the island!! Love the countertop — it looks like a dark charcoal gray. And great gooseneck faucet. .-= DesignTies´s last blog ..Hooked on… summer fun & giveaways!! =-. I can only dream of all that storage…, and organization. It’s a beauty for sure! And BTW after repeating it (Adirondack) over and over, I’m finally able to say it right without “thinking”. Have a great weekend! .-= Maya@Completely-Coastal´s last blog ..The Adirondack Chair -From the Mountains to the Hamptons =-. I am visiting from Julia’s Hooked on Party. Thanks for sharing! Yeah, organized spices are the spice of life! lol I just had my little kitchen fairies help me with mine (see my hooked on post). The tree would bother me too. .-= Bridget´s last blog ..Hooked on Improving =-. .-= Susan´s last blog ..kitchens & dining | What do you think about this year’s winner? =-. I’ve been drooling over this kitchen for a few days but I gotta agree with you on the Cons. I’m contemplating changing up my own kitchen with white paint but I’m finding it hard to take that first step. At least looking at pretty photos is easy and painfree! LOL! .-= astrid´s last blog ..* Mt. Horeb and Blue Mound State Park =-. That island is really long! I like the white beadboard and the drawer storage ideas! .-= Jenny´s last blog ..Hooked On Fridays: Homeschool Deal & Giveaways =-. I hadn’t seen this yet! It’s beautiful. Good point about the long island, though. Hadn’t thought of that, but you’re right. Might get old having to walk all the way around it each time. Other than that, I love it. .-= Julia @ Hooked on Houses´s last blog ..Hooked on Outdoor Dining =-. .-= Atticmag´s last blog ..Recipe – Pasta Lover’s Potato Salad =-.